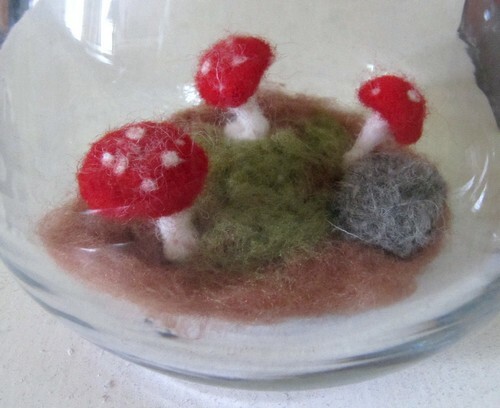 Needle felting wasn’t something I’d given much thought to trying until Two Cheese Please released her gorgeous toadstool terrarium kits last year. I snapped one up at the Stitches and Craft Show, but then, like everything else I snap up with good intentions it sat on my desk for months. And months. A couple of weeks ago I was looking for something to do and gave it a go. The instructions were very clear and before long I had my own little patch of toadstools sitting in the lounge room. I’m happy with how they came out given I’ve never attempted this craft before. adorable! you and holly are both so clever!